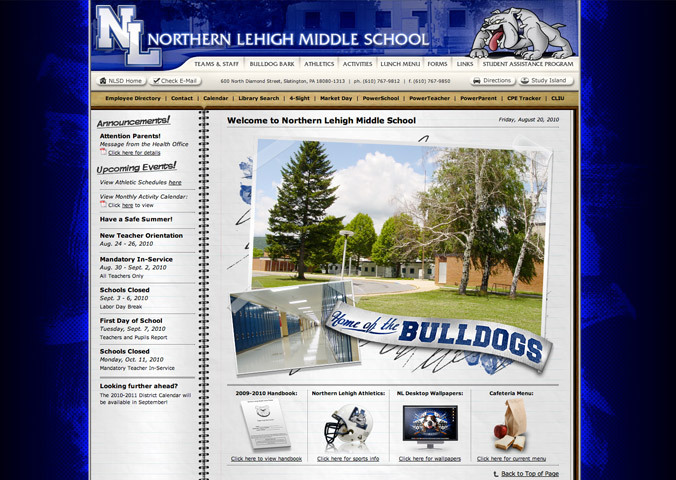 Kernie Cam Productions redesigned the Northern Lehigh Middle School website in the summer of 2007 to provide visitors with an improved navigation system and easier accessibility to important information and documents. Using HTML, PHP, and CSS, the site features an intuitive framework with a consistent header, footer, and left-navigation column to aid students, parents, faculty, and community members as they browse the new site. In addition to the coherent interface, students and parents have the ability to check classroom assignments, download essential documents and forms, view athletic schedules and lunch menus, and e-mail teachers and staff directly from the new website. An archive of the school's student newspaper, The Bulldog Bark, has also been made available for viewing in PDF format.